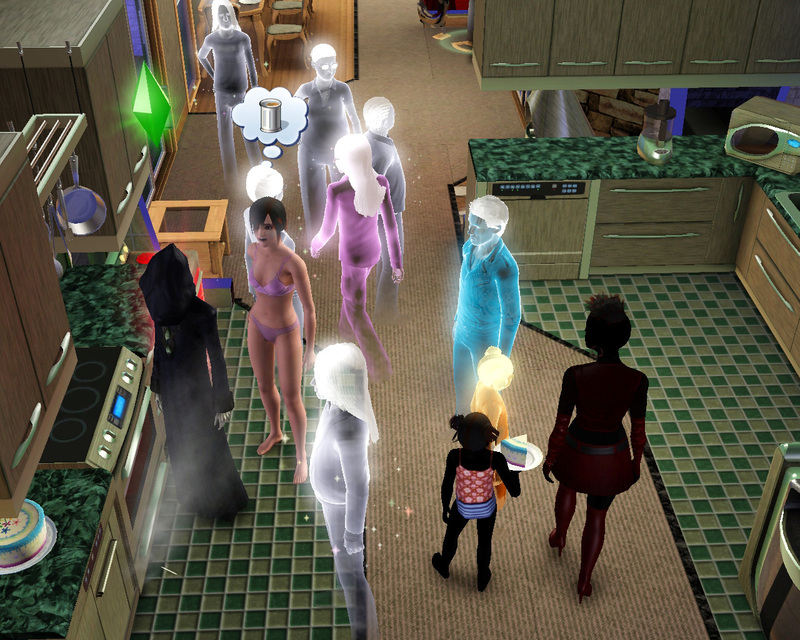 So, in my Sims 3 legacy the ghosts of dead family members are starting to get in the way. Every night they all come out. I liked it better in the Sims 2 where only some of the ghosts would come out in a given night. Vernell had a birthday and 8 ghosts swarmed into the kitchen. They all wanted cake. By the time the ghosts took their slices, there was no cake left for my regular sims. The other problem I'm having with the ghosts is they sleep in my beds. There's no way to wake them up, either. So the sims I'm controlling can't even sleep some nights. The ghosts also have a way of breaking things. The color of the ghosts shows how they died. White is old age, purple is starvation, orange is burned alive, and blue is drowned. There is also yellow which is electrocution, but I don't have any of those yet. Yes, that blue one is Jerad. Aren't there some kind of Sims Ghostbusters you can call? @ Vid: I think that's only an option if you start your house on an Indian burial ground. I've never had any special events like that, but I've read people sometimes do. Besides, the legacy is progressing without many problems... Almost getting boring, so I welcome a little added challenge, I suppose.